2009. 208 pages. Hardcover. Doubleday. I was aware of Ayelet Waldman for her now famous 2005 New York Times article where she stated that she loved her husband more than her children: “Truly, Madly, Guiltily”. After starting Bad Mother, I realized I’d never read that article myself, so I went back to it. I recommend reading the article before reading Bad Mother as Waldman refers to it several times in the book, and you’ll want to know what she’s talking about. In the article, Waldman muses that she might be considered a “bad mother” because her husband is still the center of her world, not replaced by her children. In Bad Mother, Waldman expands upon the concept of the “bad mother.” She tells stories about her own experiences with motherhood, her efforts to be at least a “good enough” mother. I am nowhere near having kids right now, but as I observe relatives and friends starting families, it makes me think about what I would be like as a mother. I am aware of the impossible standards that have been set for mothers by society. Waldman calls this type of society the Bad Mother police: strangers ready to reprimand you in public for any slip in the perfect mother composure, online commenters in mommy forums, mothers of your children’s playmates and classmates. Motherhood is scary enough and then one has to worry about being constantly judged on your parenthood choices. Waldman herself admits to times when she has been unjustly judgmental of other mothers. The primary strength of Bad Mother is in Waldman’s often startling and articulate honesty about her experiences and feelings. She opens the door to a discussion of motherhood that is not about finger-pointing but about sharing one’s struggles. From her battles with being bi-polar and a mother to her feelings about her mother-in-law, she has really laid herself open. The chapter “Rocketship” is particularly personal as she describes her and her husband’s decision to have an abortion when an amniocentesis reveals a genetic defect in their third child. It’s a chapter that deserves to be mulled over, no matter where you stand on the issue of abortion. I also liked Waldman’s chapter, “So Ready to Be the Mother of a Loser” where she realizes that she has been ready to have her children go through the same ostracism that she did, but it turns out they are well-adjusted and liked at school. It throws her for a loop. I was so happy to hear her talk about this because I’ve wondered what one does when your child has a completely different childhood experience from your own. I am not like Ayelet Waldman in many ways – in stage of life, in some opinions and perspectives – but I find her account of motherhood in Bad Mother to be both encouraging and thought-provoking. It’s a book I expect I’ll be referencing in future conversations. My teaser is from Ayelet Waldman’s book Bad Mother: A Chronicle of Maternal Crimes, Minor Calamities, and Occasional Moments of Grace. To give some context for the teaser, Waldman has learned that her children are playing dodgeball at school and is recalling her own experiences with dodgeball. I remember quaking under the gaze of a huge blond girl who even then I knew was destined to consider eighth grade as the apogee of her life. She smiles, heaves back her strong arm, and whales the ball. 2005. 324 pages. Hardcover. G. P. Putnam’s Sons. This is the third book in the Monkeewrench series, authored by a mother-daughter writing team that goes under the name P. J. Tracy. The series is set in the Twin Cities mostly, with forays into Wisconsin. The Monkeewrench gang consists of a team of odd tech wizards, led by the tough, wary Grace MacBride. In the first book, the gang got tangled up with a police investigation of a serial murderer. This brought in Minneapolis detectives Leo Magozzi and Gino Rolseth, Wisconsin sheriff Mike Halloran, his deputies Bonar Carlson, and Sharon Mueller. While the Wisconsin crew was absent for the events of the second book Live Bait (and they were missed!) they return in this third thriller. In Dead Run, the Monkeewrench team has been traveling the country, donating the use of a profiling software to police departments. Sharon Mueller, now working with the FBI, has called in a favor with the team to help out with a case in Green Bay, Wisconsin. While Sharon, Grace, and Annie (one of the Monkeewrench people) are traveling in Wisconsin, they get stranded in a remote part of the state. They walk into the village of Four Corners, but all the residents are eerily missing. Something has gone very wrong, and the three women soon find themselves in survival mode. Meanwhile, their colleagues and friends, a couple of whom have romantic attachments to the women, are desperately trying to find them. 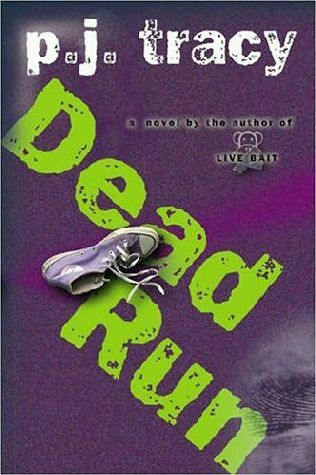 Dead Run is definitely an intense thriller from the beginning, when the reader is given an unsettling snapshot of Four Corners’ quick transformation into a ghost town. The creepy atmosphere and danger faced by Grace, Annie and Sharon pulled me right in. There’s an interesting dynamic to the book as all the main female characters are together and all the main male characters band together to search for them. The authors are definitely aware of this dynamic and emphasize that this is not a damsels-in-distress story. The women are not perfect, but they are highly resourceful and pool together their strengths and intelligence to try and stay alive and figure out what’s going on. When the guys do arrive, it’s not so much a rescue as a reuniting of a team for the purpose of defeating an impending disaster. I find the characters immensely likable. I was especially happy to see Mike Halloran and Sharon Mueller back as they were my favorites from the first book. Still, I can’t say that character development is the series’ strong suit. I didn’t walk away from Dead Run feeling like I knew the characters much better. I did appreciate seeing the enigmatic Grace through the eyes of Sharon and Annie as that did give some nuance to her. There was a Goodreads reviewer who gave the book one star because she was annoyed by how all the female characters had some traumatic backstory and also how the bad guys constantly underestimate the women because they are women. I bring up this review because I noticed these two things as well. I did find the women’s flashbacks jarring and they took me out of the story. I also thought the authors included a few too many instances where men (both good and bad) make snide, snap judgments about the women’s abilities and motivations. In some instances it worked quite well, but in others it seemed less natural and more like the authors were trying too hard to make a point. However, unlike the other reviewer, for me these were minor distractions from what was overall a worthy, exciting thriller. I am definitely looking forward to reading the next book in the series. 2008. 294 pages. Hardcover. Pantheon Books. Lavender “La” Stone is an ordinary woman whose marriage falls apart right before World War II breaks out. She moves from London to a house in the country. She joins in several home-front initiatives to support the war effort. One of these initiatives is an orchestra, which joins together villagers and men from the nearby military base. A Polish airman attracts her attention, but all of La’s relationships including this one, are tested by the demands of war. 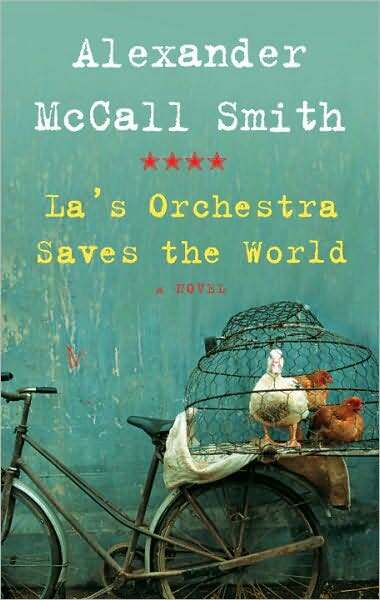 A back-jacket blurb from The Scotsman states that McCall Smith’s character portrait of La is “[a]n excellent re-creation of a woman of her time.” I have to agree with this. It’s refreshing to have a character who is somewhat blinkered by her societal upbringing. La is optimistic about the war’s outcome, but it comes off as naiveté to the other characters, rather than as miraculous foresight. Though a generally trusting person by nature, she is influenced by the tense atmosphere of the times, where the public was regularly cautioned about possible enemies in their midst. Though it isn’t stated explicitly, the betrayal of her husband is probably to blame for her shaken trust in others. I enjoyed seeing the development of La’s relationships to the other characters, especially the arthritic farmer who she helps as part of the war effort, her friend Tim, and the Agg family. I was expecting more of a romantic plotline between La and Feliks, the Polish airman, based on the book jacket’s summary. However, as the book unfolds, I realized that it’s more about La’s conflicted feelings about Feliks than on the development of a romantic storyline. And that seemed more in tune with the subdued nature of the book. It’s a quiet book about a quiet life. Plenty of things happen, but they are not epic or dashing. It’s a home-front story about regrets, hopes and small victories. I would describe it also as a contained story. It doesn’t go off on rabbit trails but stays solidly on La. I did appreciate the way the book highlighted the Polish contribution to the British war effort, and particularly on the subsequent feelings of betrayal when Poland was ‘given’ over to Russia. Though it’s not a book that made a deep impression on me, I enjoyed it well enough. If you like the time period and setting, it’s worth checking out. 2001. 213 pages. Hardcover. Random House. Murray Tepper is a middle-aged denizen of New York City who works in the direct mail business and has recently started the habit of reading a newspaper in his parked car. However, he doesn’t need to park on the street as he pays for a garage. This odd habit bewilders his family and also attracts the attention of strangers. Other drivers are confused and angry that he is not leaving the spot that they want. Members of the public find him either eccentric or a heroic figure: someone who is asserting his constitutional rights, someone who is somehow ‘sticking it to the man’. People seek him as one does a guru, and they sit in his car and tell them about their problems. The mayor, who finds hailing taxis from the street an act of anarchy, claims that Tepper is purposefully causing chaos. Tepper himself is a calm, placid enigma at the center of the hubbub. I don’t read a lot of comic novels, so this book was a nice change of pace from my usual reading material. It’s not laugh-out-loud funny, but it is slyly humorous throughout the story. 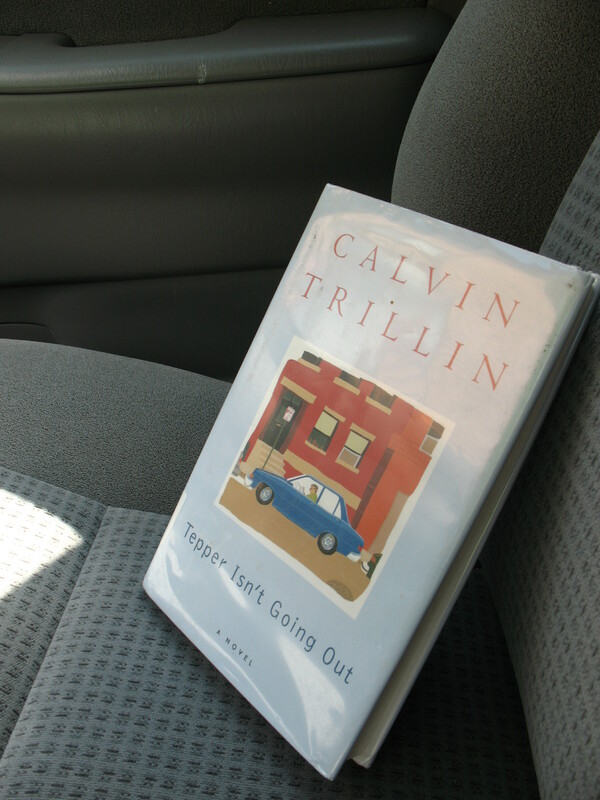 The comedy lies in how Trillin takes mundane things like parking or the direct mail business and makes them the main focal point of characters’ energy and strong opinions. The mayor in particular is a figure of ridiculousness. He institutes a level of security in the city hall that is at a paranoid level, and fixates on parking as the root of all the city’s ills. The mayor sat staring into the middle distance for a while, occasionally muttering a word like “fool” or “degenerate,” like a motor that is basically about out of fuel but is still coughing a bit irregularly. There were some comic bits that didn’t work well for me, such as a repeating joke involving a sushi restaurant, but the best parts were those involving Tepper himself and the ongoing parking saga. The punchline at the end, which ties together the parking and the direct mail themes, was clever. Tepper is made to be a folk hero by most characters but the end hints at a possible different interpretation, leaving it to the reader to make the final judgment. This is not a book I can necessarily rave about but it was pleasant and enjoyable, and makes me think I should try more straight-up comic novels in the future. The book is also one of Thomas from My Porch’s all-time favorite books. 1999. 292 pages. Hardcover. Houghton Mifflin. David M. Carroll is a naturalist and artist who resides in New Hampshire. Since childhood, he has had a love for the wetlands. I did not know this until after I’d finished the book, but Swampwalker’s Journal is the third of what Carroll calls his “wet-sneaker” trilogy. The first two books are The Year of the Turtle and Trout Reflections. 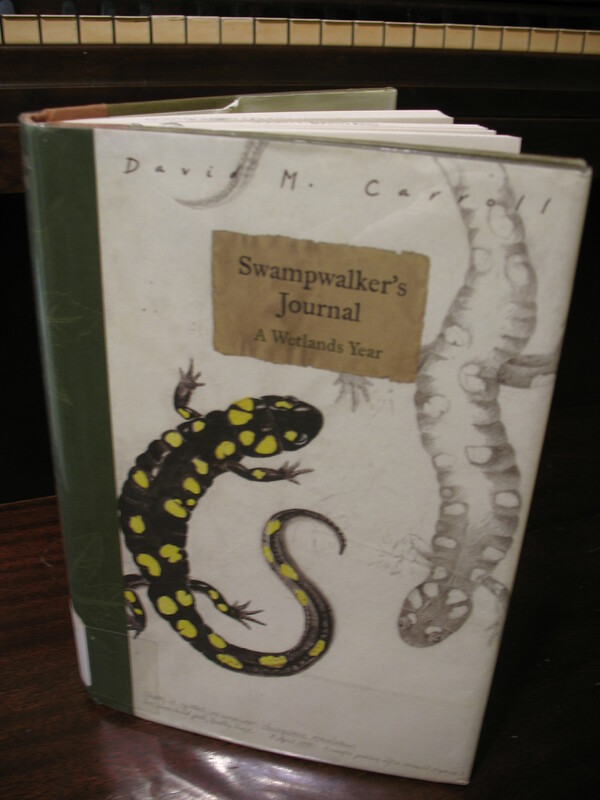 In Swampwalker’s Journal, he records field observations of the creatures and plants in the wetland ecosystems near where he lives. He uses these observations to underscore how much would be lost and has been lost by human destruction of the wetlands. The book is divided according to wetland type: vernal pools, marshes, swamps, ponds, floodplains, bogs and fens. I love reading non-fiction, but I can’t deny that it is often a slower reading experience than reading fiction, especially when it is so dense with detailed observations and facts as Swampwalker’s Journal. The reward of such a reading experience is the deepened understanding of wetlands and the creatures that live in them. Also, I feel smarter. When I first started the book, I was a bit daunted by Carroll’s paragraphs about plant life. Though his writing is not dry, I found it hard to picture what he was describing sometimes and lists of plant types and names meant little to me. Where the book shines is in Carroll’s ability to show wetland creatures as individuals. He’s not anthropomorphizing them, but his encounters do imbue them with personality. The book is threaded with these kinds of up-close interactions from turtle hatchlings, to beavers, to even a bear. Carroll rarely intercedes as he does with that wood frog, but it’s interesting to see when he does decide to break the role of observer. This is not a book I would recommend to someone who has never read nature writing before, but if wetlands and/or frogs, turtles and salamanders interest you, then it is definitely a worthwhile read. And don’t just take my word for it. The book’s cover listed praise from such authors as Bill McKibben, Annie Dillard and Sue Hubbell. It also won the John Burroughs Medal for Best Natural History in 2001. This Library Loot is actually from a couple of trips. It’s mostly young adult novels and one short novel because I still have longer books hanging around from earlier loots. Also, I have Sir Walter Scott’s The Talisman out from the university library and it keeps getting passed over in favor of the books with imminent public library due dates. So here is my loot! 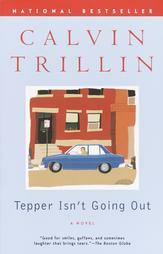 Tepper Isn’t Going Out by Calvin Trillin – I heard about this book via Gaskella. It sounds like a light, fun read about a guy who likes to read the paper in his parked car and because it is New York City and his parking spots happen to be desirable, this simple action causes consternation and admiration from fellow NYC denizens. 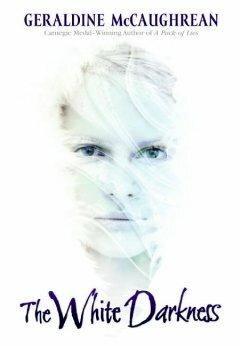 The White Darkness by Geraldine McCaughrean – The teenage protagonist has obsessed with the Antarctic as is her uncle, but when he takes her on a journey to that continent, it is a tale about survival. This was also a recommendation from a book blog – The Bluestocking Society. 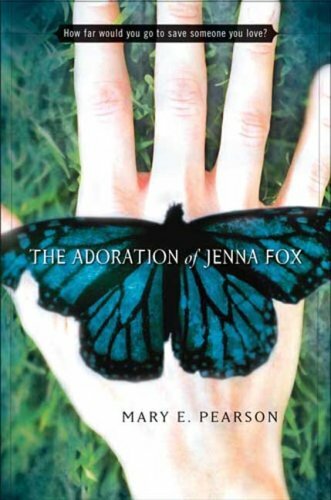 The Adoration of Jenna Fox by Mary E. Pearson – I have seen rave reviews for this one everywhere. A seventeen-year-old girl wakes from a yearlong coma and slowly has to piece together her memories and happened after the accident that put her in the coma. 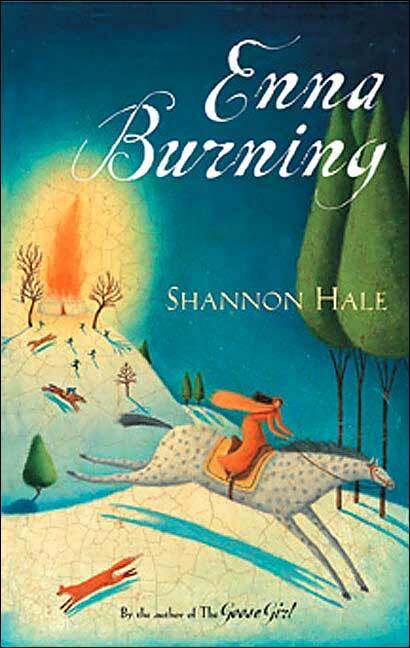 Enna Burning by Shannon Hale – This is the sequel to Hale’s Goose Girl which I enjoyed. This follows the path of a supporting character from the first novel. 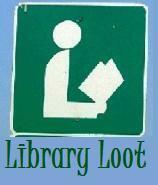 Library Loot is hosted by Eva and Marg.